interaction for its members in a range of events throughout the year. Any member of the College or University is eligible to join, regardless of the subject they take. 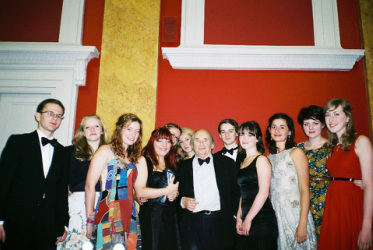 Last Michaelmas term began with an annual dinner with Quentin himself (Left: Quentin Blake and the 2011-12 committee). Throughout the year it hosted a wide variety of events: from talks by Zoya Phan, a Burmese refugee and political activist and Doctor Who screenwriter and Downing alumnus Terrance Dicks to Christmas and Mayweek parties, chocolate and champagne tasting and film screenings in the Howard Theatre. The society hopes to facilitate students to engage with their extracurricular interests, and most importantly have some fun during their time here. We see this website as a very important means by which to fulfil our aims: if you've got ten minutes to spare check out our members work on our Exhibitions page as it develops or for twenty minutes worth of fun/procrastination see our arts blog. If you are interested in joining the society, please send the Presidents a quick message to find out more, we love to welcome any new members!